The magic and mystique of the iPhone 3G will only increase over the coming months, judging by the effect of the first generation model. A number of companies will release accessories intended for the new model (though in all honesty would probably work with the iPhone 1.0 and the iPod Touch) and of these, Griffin is among the best manufacturers. So it’s no surprise the half lion, half eagle manufacturer has come out with a treasure trove of goodies for Jobs’ new toy. The NuForm with EasyDock, at £18.99, is designed for all those who want a nice piece of sleek-looking kit then want to trap it in a big plastic case, will be available in black or white. The Elan Form with EasyDock (sensing a theme? ), also £18.99, has a leather exterior, can fit in your purse, and comes in black or pink. Wonder which demographic this one is aimed at? SmartTalk (£12.99) will allow you to listen to music and videos through earbuds, with a remote control attached for skipping and other iPhone-y exercises. Also doubles as a hands free kit. Sennheiser does a similar thing, but costs over four times more, so if you’re one to lose peripherals, have a look at this. TuneBuds Mobile (£24.99) appear to do exactly the same thing, but come with three sets of silicon earbuds to help fit your lugs nicely. 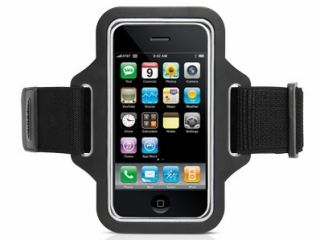 The Streamline armband (£18.99) is a neoprene strap for those of you who love to run or exercise with tunes, or just prefer to have a phone holster somewhere other than your belt. Also doubles as a reflective band for night-time running. All are available from The Carphone Warehouse or other major retailers. Pop on down…obviously AFTER the iPhone 3G lands in July. Otherwise you might pop with excitement.